UML- Maoist Centre unification approved, new party to be registered today itself - Integration Through Media ....! KATHMANDU: The party unification coordination committee meeting held at Prime Minister’s official residence, Baluwatar has finalized the unification bid. The meeting held between the chairs of CPN (UML) and CPN (Maoist Centre) on Wednesday had forged consensus in principle to finalize the bid. Both party chairs had informed their party meeting about the progress and consensus regarding the unification. The merger committee meeting today, approving the unification bid has also approved the interim statute and organizational report of the new party, said UML general secretary Ishwar Pokharel. The new party will be named as Communist Party of Nepal. Similarly, the guiding principle of the party will be of Marxist and Leninist doctrine. The party will led by co-chair system. There will be 43 standing committee members (25 from UML and 18 from MC), 441 central committee members (241 from UML and 200 from MC). The electoral symbol of the party will be the sun. 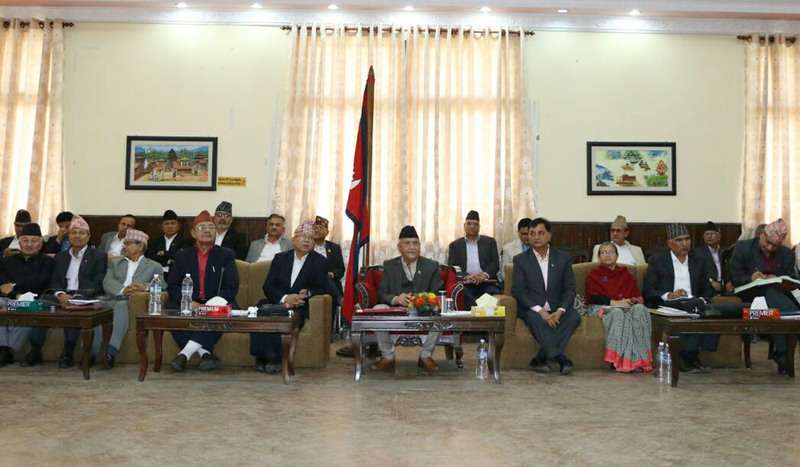 Central Committee meeting of the CPN (UML) is currently taking place at official residence of the Prime Minister at Baluwatar soon after the conclusion of the Party Unification Coordination Committee meeting. According to Secretary at CPN (UML) Central Office, Krishna Gopal Shrestha, a programme has been scheduled to inform the central committee about party unification. A central committee meeting of the CPN (Maoist Centre) is also going to take place today. Party Spokesperson Pampha Bhusal said that Chairman Dahal would briefed the meeting about party unification. A programme has been scheduled where CPN (UML) Chairman KP Sharma Oli and CPN (Maoist Centre) Chairman Pushpa Kamal Dahal would reach at the Election Commission and register unified party as per the agreement reached at the Party Unification coordination Committee meeting.